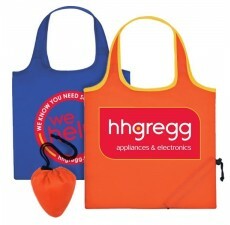 These handy and convenient custom tote bags are the perfect size for shopping trips, sporting events, and a number of other activities, providing your customers with something they truly value. The unique inner zipper pocket is a cash and small items organizer when the bag is unfolded. 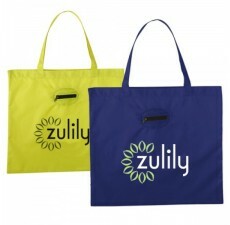 For storage, simply fold up the bag and tuck it away inside the pocket to create a portable pouch! 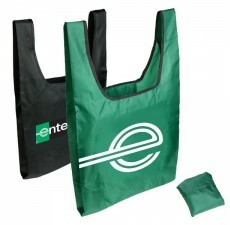 The eco-friendly, recyclable material used to make these custom tote bags is durable to withstand years of regular use. 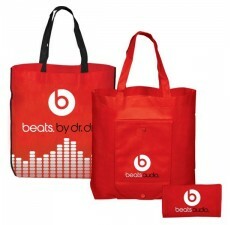 Print your company’s unique logo on the front and pair it with your selection of a number of vibrant colors for maximum brand awareness. Contact us today to learn more about the customization process.